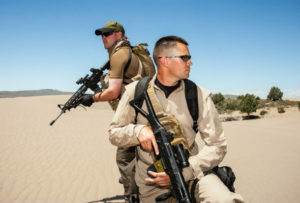 Foreign mercenaries, mainly from Columbia and Nepal, fighting on the side of the Saudi Arabia-UAE-led coalition in the conquest of Houthi-controlled Al-Hudaydah port were recruited by former Palestinian Fatah official Mohammed Dahlan who oversaw their training in Israel, Al-Khaleej Online reports citing unidentified sources. “Hundreds of mercenaries of various nationalities are taking part in the attack on Al-Hudaydah, with the aim of taking control over it from the Houthis who have shown fierce resistance,” the media quoted some informed but unnamed sources as saying. The sources according to the media are close to the US Congress Intelligence Committee. The port located on the Red Sea has been since June the theater of fierce fighting between Iran-backed Houthi rebels who control it and Saudi Arabia-UAE coalition that is backing the Yemeni army. The coalition’s efforts to dislodge the rebels turned out fruitless but last week the Yemeni army managed to cut off the main road connecting Al-Hudaydah to Sanaa which the Iran-backed rebels also control. The sources told Al-Khaleej Online that foreign fighters have been involved in the fight for the port conquest. The fighters among whom Colombians and Nepalese have been recruited by former Palestinian commander Mohammed Dahlan, who now serves as personal security adviser to Abu Dhabi Crown Prince, Mohammed bin Zayed (MbZ), the media reports citing the sources. Dahlan also oversaw the mercenaries’ training by Israeli army commanders in the Negev desert, South of Israel. The former Palestinian official and now MbZ’s protégé according to the sources, visited on several occasions the training camps hosting the paid fighters. Israel and the UAE have no official diplomatic relations but it has been reported that the two countries have been engaged in covert cooperation in several areas, including security, and against Iran.